Once upon time many eons ago at Bolehland, lived a kid named Spectre who love to kill tomato (Not the tomatoman at Bolehland) for a living and fun, loot other kid toys, smash other people thingy, bully girls to tear ............... sound very indeed wrong, right! Almost forget this post about donuts. Yes, when I was a kid (before growing up to be a demon lord) I have an unstoppable crazy craving for donuts. It was unusual for me to have few dozen donuts from the *Rotiman* dude (A cool dude that use 3 wheel motorcycle to sell bread and similar thingy) that cost about 30 sen back then every single day . It is considered a no-frill donuts sprinkled only with sugar but hey! its taste great superbly to perfection. How time flies so fast! Today, we have lotsa choice in term of donuts in variety with named like UFO donuts and *ahem* price that cost a fortune. 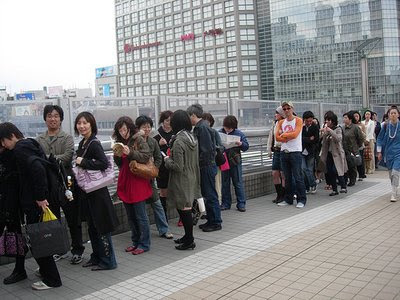 Even the ordinary citizen of Tokyo could not fight off the power of Krispy Kreme Donut shown below. Nothing can stop me from having donut today! Hurry! Take cool picture of us standing for hours! ISK! My craving is killing me! I waited for hours! Only one boxy! Gimme a dozen! lol! It a human stampedes for donut! OMG! 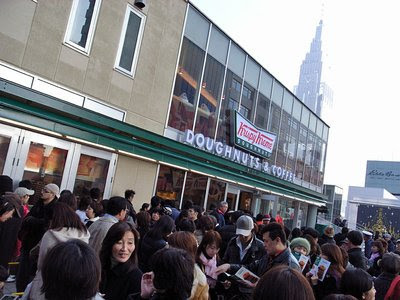 Lesson to be learn here that the Krispy Kreme Donut is powerful weapon to lure everyone out from their hideout. Note. It currently not available at Bolehland. Rumours has it that it will be opening in Bolehland soon. Krispy Kreme has the BEST donuts!!! 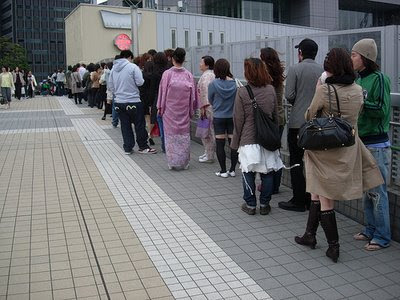 omg the queue is sooo long! Krispy Kreme Donut so overpowering even not yet "open for business" but so many people want to eat it ! Sure going to a hot seller when it open here at bolehland ! PS: i will the 1st in the line ! PS 2 : For free donut, anythingy is possible!